This piece is about 14 printed pages long. It is copyright © Martin Duwell and Jeffrey Poacher and Jacket magazine 2010. See our [»»] Copyright notice. Martin Duwell is Australia’s leading poetry critic, having published over two hundred essays and reviews about contemporary Australian poets. Much of his criticism has appeared in national newspapers and magazines, but in 2006 he began Australian Poetry Review as an online format for longer review-essays. In addition to his critical writing, he has edited numerous scholarly works about Australian literature and, with R.M.W. Dixon, two collections of indigenous song poetry. From 1970 until 1981, he was the editor of Makar Press which brought out the early work of poets such as John Tranter, Alan Wearne, Jennifer Maiden and John Scott. Since 2003, he has been one of the general editors of the annual anthology, Best Australian Poetry. 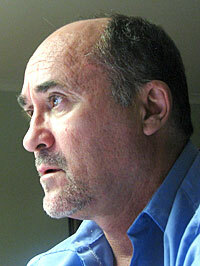 Martin Duwell’s website is www.australianpoetryreview.com.au. Jeffrey Poacher’s essays and reviews have appeared in HEAT, Australian Book Review, The Times Literary Supplement and various academic journals. Q: In over forty years of poetry reviewing, how many death threats have you received? A: Thankfully none — which is evidence perhaps that Australian poets are remarkably calm and sane. Actually, beyond a few brief thank-yous and a couple of puzzled or miffed letters, I’ve rarely had much feedback from poets about my reviews and I think that’s probably a dignified and sensible thing on the part of writers — there’s nothing worse than a correspondence column being taken up by increasingly fractious replies to replies to replies to someone’s review of a book. Q: I know that one of your models for reviewing is that brilliant compendium by Richard Howard, Alone with America. How would you characterise your style as a reviewer? A: Almost entirely descriptive/forensic. For me books of poetry and bodies of poetry pose questions: what is this trying to do? What is its attitude to meaning, to the nature of poetry? Where does it fit in with what else is being done? And so on. Friends often ask why my reviews aren’t more evaluative. They see the central question that a critic faces as being: Is this any good? Or, where does this fit on some scale of quality? I’ve never thought this was a major question when it came to reading poetry, though I know that, in a practical sense, it can be an important question for readers of reviews. You know the kind of thing: I only have so many dollars to spend or so many precious hours free, please tell me what to spend them on. I’m guilty of this myself in fields where I’m an outsider. As part of an attempt to be more au fait with the music of the last century, I read a lot of critical material but the most useful was a collection of reviews by the late Alan Rich which contained as an appendix (accompanied, I seem to remember, by exactly the kind of moaning that I’m producing now) his list of the hundred best works of the twentieth century. At a practical level that was terrific because you could say: here are a hundred works to build my listening around. Anyway, for reasons that I don’t fully understand but which may involve the fact that I come from an academic background or that I am one of the few reviewers of poetry who is not a poet himself, I resist the idea that reviews should be evaluative. This irritates friends who are poets because they would like to see what they are inclined to call undergrowth being torched by the flamethrower of critical truth (it’s amazing how consistent their metaphors are). But of course their real reason for wanting the “undergrowth” cleared away is so that they themselves can be seen to better advantage and the precious book-buyers’ dollars will be more likely to be spent on them. They also often quote Yeats’s famous comment at the Rhymers’ Club, “The one thing certain is that we are too many”. All I can say is that, in my view of creativity, there can never be too many genuine poets. Also, I really resent criticism which is basically evaluative because, deep down, it’s gatekeeping. It thinks that the function of writing about literature is a matter of standing guard and deciding who is allowed in and what sort of riff-raff is to be kept out. I know that I’m shifting notions of nationality around in a very dubious way here, but this seems un-Australian to me. It seems like the kind of thing I would expect to occur in, say, England (though I admit that my notions of that country’s class system are probably based on little more than Australian prejudice). You mentioned Richard Howard’s book which is also what I would call descriptive/analytical. I was bowled over when I read it and I haven’t looked at it for a long while (in other words I don’t go to it as a critical model to get ideas) but I suspect that a lot of my admiration lies in the sheer logistics of it — how do you write so many analyses (forty from memory), and keep them so up to date. I don’t think I could ever have done that. But it reminds me that a more important influence on me was probably George Bernard Shaw’s music criticism which I read in a little Penguin selection when I was an undergraduate and I’m now, finally, reading in its entirety. I can still quote from memory large slabs of some of those reviews (the Mahler-conducted Siegfried, for example). But it’s interesting that Shaw’s method is exactly the opposite of mine. It’s entirely evaluative. He has a worked-out set of requirements for works and performances and then pretty well ticks boxes. It’s brilliant writing because his pre-formed system is so good (Bach, Handel, Mozart, Beethoven and Wagner form a kind of first team). It has stood the test of time pretty well (though we wouldn’t have the same attitude to Schubert that he had!) and also because he has that magical prose skill of writing scathingly without ever appearing to be anything but a good man. In fact he might have invented that skill because we now call it “Shavian”. Perhaps we’re most influenced by things which are very different from us, temperamentally, or perhaps I was just attracted by really informed writing that was always enjoyable to read. Q: In an interview with Jacket in 1985, John Ashbery said that becoming famous didn’t alter the way he writes poetry. Is it different for reviewers? When you started to become well-known as a commentator on Australian poetry, did that change your approach to reviewing in any way? A: I don’t think the words “well-known”, “reviewing” and “poetry” sit very comfortably together, certainly not in my case! The only way that I can think that being “well-known” would affect a critic would be that he or she was more likely to be rung up by a journalist for a spot opinion if a writer won a major international prize or (more likely in Australia) was involved in some sort of scandal. If I think of my own writing career, such as it is, I think that the only things that have really changed are the things you would expect to change with experience. You are less concerned that, at the end, you will simply have nothing to say about a difficult book that you can’t make much sense of. You realise that you have met many tight deadlines before and so you’ll be able to do it again. Those sorts of things. But you’d have to remember here that I started writing very late: for the first half of my adult life I would have seen myself as an editor, publisher and teacher. So there isn’t the huge time spectrum that some writers might have. I think if you were publishing confident, know-all reviews in your late teens or early twenties, the odds are that by the time you got to your sixties you’d probably have changed enough to be fairly ashamed of your earlier efforts. Though there’s Henry James, of course, for whom that can’t be said. Q: Everybody knows that a poem can be hermetic — full of in-jokes and abstruse references and so on. How can you be sure that your review is decoding a poem in an accurate, or at least adequate, way? And, more importantly, how can you convey that it’s worth the effort for readers to do that for themselves? A: I don’t think you can be sure. In fact, if anything, you can only be sure that there will be thousands of details which are luminous to the poet but which you fail to see in this “correct” luminosity. That’s probably not very well put but fellow-critics will know what I mean. On the other hand, being an outsider (all readers are outsiders), means that you are able to give the poet precious feedback. If you think the poem is a good one — or good enough for you to want to write about it, (i.e. explore in greater detail) — the fact that you think so without understanding various keys, various personal authorial significances, means that the thing works for an external reader. And that is information that a writer wants to have. I haven’t expressed that very clearly but it is a complex area. An example might help: Auden’s “Lay Your Sleeping Head” was probably read for years (perhaps by elderly teachers) by people who did not know that it’s a celebration of homosexual, not heterosexual, love. I imagine them fondly picturing attractive female partners rather than male ones. But because it’s a great poem as a poem, in the long run, this hasn’t mattered. One of the challenges and pleasures for a critic is the way in which, the better you know a writer’s work, the more likely you are to see “in-jokes” and abstruse references. If, more than half a century ago, you’d read your Eliot carefully (rather than devouring the scholarly castles being built over his work), you would know that those hyacinths were important personal markers for him. The paradox I have always worried about here is that there can be a chance finding-out of something significant which entirely affects your reading of a poem. In other words, there is no mechanism by which in-jokes and references are eventually solved and they often come to light accidentally (in interviews, say) or don’t come to light at all. Another example — I’m picking elderly ones so that I don’t have to speak about contemporary writers — is a little poem by Douglas Stewart, “B Flat”. I used to use it for teaching though I was probably more intrigued by the issues it raised than my students were! It’s a nice little pacifist work celebrating the brother of Gilbert White who took a pitchpipe and measured the pitch of the local owls’ calls as B-flat. Was the title a joke, an instruction to writers not to be grand but to be, comparatively, flat? Well, probably — readers are unlikely to see something that a poet didn’t see before them. But in a note which I found in UQP’s Poets on Record series (not, in other words, a widely disseminated source) Stewart makes the comment that he wrote the poem on the day China and India (the world’s most populous nations) went to war (it was a border dispute and, fortunately, was resolved fairly quickly). That single randomly acquired fact affects forever how we read the poem. Q: In a recent interview (published in Jacket 38), the American poet John Olson (who has also written a lot of poetry reviews) points out that reading poetry takes a lot of effort. “You can’t just plug it into a wall and sit back and dig the action,” Olson says, “you’ve got to put your hard-hat on and enter the construction and do some work.” This seems to me a very useful metaphor, but it doesn’t perhaps capture poetry’s various forms of pleasure. Perhaps you’d like to comment on that. Your reviews often inquire into why a particular poet’s work is pleasurable — you pose this very question, for instance, in a review of Laurie Duggan’s The Passenger. How is it even possible to describe the joys of poetry? Have they changed over time for you? A: That’s a difficult question, if only because in listing the various pleasures of poetry you are always likely to descend into clichés. But it’s true that I respond to all the usual pleasures that poetry can provide: revelling in language — its sounds, its complicated history, its idiocies, its capacity for eloquence — if it’s that kind of poet and it’s done well; enjoying poetry’s ability to celebrate rhapsodically as well as mourn eloquently; enjoying surprises — some of which come years after you first read the thing; enjoying beautiful structural shapes; enjoying risk-taking; enjoying that extraordinary tightness and tenseness that some poems have; enjoying the weird effects when a style is borrowed from an alien culture and moved into an Australian context (a process of borrowing that occurs in poetry everywhere) and so on and so on — all the usual suspects. I suppose these are, in a way, passive pleasures although they shouldn’t lull you into not continuously working on your reading skills. Less passive and probably a deeper pleasure for a critic is the business of making sense of something, of working out what is the best way to respond to it. I always think of dealing with a poem at this level as a bit of an existential encounter where you have to approach it with something at stake yourself (again, very different from the imaginary critic’s removed, judgemental self). When I really get going, I enter a pleasurable state I call “interpretive frenzy” where, for reasons I don’t understand, I want to know everything about the work — when it was written, how it fits into everything else the author has written, whether it was written by pen, typewriter or computer etc. It’s all a mad attempt, doomed to failure — but still a good thing to attempt, despite that — to totalise context and meaning. Unfortunately (or perhaps fortunately) it doesn’t happen all that often and, when it does, doesn’t last too long. But that state, for a critic, is deeply pleasurable. A: I think it’s the usual pleasure of making something that you think is ok which wasn’t there before. There’s also the sense that you want to offer something useful to a mode of perceiving the world which has dominated your reading life — as retired footballers say, irritatingly, it’s a matter of “giving something back to the game”! I should say that, at the highest level, I find it difficult to call myself a writer on the grounds that I never find the task pleasurable. I admire, but can’t really comprehend, people who can lock themselves away long enough to write a novel: there must be a sustaining pleasure there, but I could never experience it. If your true self is revealed by what you say when you are asked “when do you feel most truly yourself?”, I would have to call myself, first and foremost, a reader rather than a writer. Q: In a review from 1991, you said that professional readers of poetry are “forever sketching, shaping and pruning in their heads their own equivalent to the Faber Book of Modern Australian Verse”. Perhaps you could say a few words about the state of your own mental anthology. To use a drab economic metaphor, whose poetic stocks are undervalued at present? A: I wrote that nearly twenty years ago and it was true then but it isn’t true now. Either my interest in Australian poetry as a whole — as a complex growing entity capable of being described in different ways — has diminished or my macro-critical abilities have atrophied. Probably the latter. It’s what comes of being, at heart, an empiricist: to my taste it’s better not to be able to see the woods for the trees than it is not to be able to see individual trees because you are focussed only on the woods. That’s what reading poems (which do lend themselves to being prickly, irreducible, non-conforming bits of data) does to a respectable literature scholar! I have an unfinished (about three-quarter completed) project where I wrote a review of one book published each year for the period 1930–1960, omitting all the famous ones. That produced a lot of surprises. People who, for various reasons, one never bothered reading (literary history had already consigned them to oblivion), turned out to be eminently readable. Not necessarily shamefully kept out of the first eleven, but just worth reading and worth reading carefully and sympathetically. So the first five essays, for example, are reviews of books by Mary Gilmore, J.A.R. McKellar, Edgar Holt, Bertram Higgins and John Thompson. I’m avoiding your question a bit but that’s because I’m not in the business of trying to influence the market: I just wanted, in this case, to read books that gatekeepers had firmly excluded. Q: In the past, you have speculated that “the dominant tone of Australian poetry is one of quietness and dogged decency”. You said this in a 1981 review. But your later comments suggest that you might not have changed your mind all that much — in a 1997 review of Judith Beveridge’s Accidental Grace, for instance, you point out that a “celebratory rhapsodic tone” is not something we are used to hearing from Australian poets. This is an impossible question, but how would you now describe contemporary Australian poetry to someone who has never read any of it — say, a poetry-lover visiting from another galaxy? Is there any special quality about Australian poetry today (other than its Australian-ness)? A: That might prove an impossible question because I suspect that, since poetry as a totality must be the totality of all the things that can be done in language, then you can only really compare existing poetries. In other words I would need to know what poetry from beyond the Milky Way looked like. To an Iranian you would say that contemporary poetry in Australia is very secular and that the formal/informal debate was decided in favour of the informal around the mid-sixties but that, of course, was already changing. If you were describing it to Homer you’d say it eschewed narrative, etc. So when I spoke about the celebratory tone that you can find in Beaver and some of Judith Beveridge’s poems, I was probably making an unconscious comparison with the Whitmanian tradition that is part of US poetry. Q: In a recent review of Maria Takolander’s Ghostly Subjects, you lament the “lack of a strong tradition of critical response” for Australian poetry. What did you mean by that? I should add that you make this point in relation to Takolander’s collection because her work can be characterised as a minimalist poetry, and Australia does not have much of a minimalist tradition. A: I didn’t mean anything beyond the obvious observation that, in comparison with other cultures, criticism is not our strong suit. We don’t have a lot of literary journalists, creative writers and academics who, together, could write about a new work and make up a kind of spectrum of response. True, this could be because we are intellectually lazy etc etc, but it could also be because everyone with talent would rather be a “creative” writer than a critic. And that’s fine — a perfectly honourable choice. Speaking of a lack of a minimalist tradition simply comes from comparing us with South-East Asian poetic traditions (or as much as I know of them through translation) where the entire act of writing seems conducted in an intimate, social atmosphere — the equivalent of the West’s classical chamber music. In Australia I often have the sense that poets are comparatively isolated and have to shout loud and long to sustain a sense of their own vocation. Q: Since 2006, a lot of your work has appeared online on your website, Australian Poetry Review. Do you have a sense for who is reading it? A: Not really — apart from the poets themselves, of course. That website began because I’d been one of the judges of the poetry prize in the Queensland Premier’s Awards. I’d found myself reading most of the books of poetry that had been published in the previous year — usually seventy or eighty — and I thought that there were a lot of books that I’d like to look at more carefully — in the way that can only be done if you are going to write about them. I couldn’t imagine lining up editors of print journals to accommodate this so I decided to do a monthly review. The number of “hits” is not large compared with other sites but I think it’s surprisingly good for unadorned criticism. Q: Obviously, there is more room for manoeuvre in your online essays. In the open fields of cyberspace, you certainly have the freedom to crack a few jokes — for instance, counselling Fay Zwicky not to publish her terrific football poem “World Cup Spell, 1998” in Brazil, and even speculating that there should be an anthology of work by left-handed poets (thereby revealing your own sinister bias, of course). It seems to me that comic asides can be very important in poetry reviewing — they encourage readers to keep reading, obviously, but they might also communicate something of poetry’s essential jouissance. What thoughts do you have about the rhetorical strategies involved in reviewing? Are there any ways of discussing a poem that reviewers should avoid? A: Shaw and later on, Clive James, showed me that highly intelligent reviews could also be very funny. I don’t have much of their comic ability, I’m afraid, but if even someone as po-faced as me can see a joke on the horizon, then it should be cracked! Really you are asking here about what makes good reviewing and what makes bad. It’s interesting because though I refuse to be exclusively evaluative when it comes to poetry, I’m a complete fascist when it comes to criticism. Bad criticism, of all kinds — the preening, the slimy, the pompous, the waffling, the subordinating of individual texts to some trumped-up generalisation, the competing-with-the-authors etc etc — sends me into a fury. I have no qualms about being a gatekeeper there! All of which probably supports the idea that I reject evaluative criticism of poetry mainly because I’m one of the few critics who is not a poet. Q: One rhetorical strategy that does occur throughout your work is a sort of confession of ignorance. You say, for instance, that Judith Beveridge always “remains a step or two ahead” of you; elsewhere you admit that you would hate to answer an examination question on David Malouf’s poetry. These declarations of modesty are obviously important to you; it seems to me that they rightly emphasise how difficult it is to talk intelligently about someone else’s poems. Would you care to comment on that? A: It’s not a rhetorical strategy, it’s just good intellectual practice to outline the questions you can’t answer. One of the many kinds of bad criticism (now you’ve got me started I can’t keep it out of my head!) is that which glosses over difficult areas or areas that the critic has failed to make sense of. There are always going to be major works that you don’t feel you have really got much of a grip of. Martin Johnston’s “To the Innate Island” was one of those early on. So is Judith’s “Between the Palace and the Bhodi Tree”. For complicated reasons — which may relate to my dislike of Buddhism — that work always seems to orbit outside my reach. One day, perhaps, it will snap into focus. Q: Your essay-reviews in Australian Poetry Review vary in length, but they’re usually several thousand words long, each dealing with a single book. Roughly speaking, how many hours would it take you to write an essay-review like that? A: That’s also interesting because other people have, believe it or not, asked the same question! So I’ve thought about this a bit more than I had when I was asked for the first time. The answer, as far as I can honestly calculate it, is probably somewhere between ten and twenty-five hours. I don’t think I could claim that it took any longer, though sometimes a review, like the recent one on Vin Buckley, might involve reading all the poet’s books, even though you know that many will have only a tangential connection with what you are writing. If you added all that up, it would come to quite a long time but it would be like one of those tax forms where you don’t really think you can claim something though you know it was relevant. My attitude to these Australian Poetry Review reviews is that I have exactly one month to devote to a book and to saying something about it. Of course I do a lot of other things — reading projects, DIY stuff about the house, watching football and cricket and so on — but the chosen book will be simmering away in my mind for the whole month. It’s the least you can do for a writer who might have spent years on it. I gradually evolved this as a system and it works for me. Writing is so end-oriented and I get so tense at the moment when the deadline is looming and I haven’t written anything, so to approach a book in that semi-psychotic state would be very unfair to the author — it would be like only meeting people at job interviews. So I have a relaxed couple of weeks, early in the month, to make the book’s acquaintance without any pressures. I do, while I’m on this subject, have a technique that might be useful to people beginning a critical career. I make sure, before the deadline gets too close, that I can name or describe (as in “There’s the one about the dead dog”) all the poems in the book. It seems a basic level of competence that a reviewer should have. It’s also a terrific way of getting yourself to sleep in the middle days of the month if you’re an insomniac. Q: There are now many creative writing programmes at our universities, instructing people in all the known literary genres — except one, reviewing. Can reviewing be taught? Would it be in any way useful or desirable to do so? A: A complex question. As you’ll have gathered I see reviewing (and good criticism generally) as a creative act — after all you make something that wasn’t there before and which does have some sort of purpose. Probably, though, I would want to say that I see it as a branch of the general discipline of learning to read (rather than learning to write) and learning to read is a really crucial skill that universities can teach (or perhaps, help students to teach themselves). I’d like to think that all good university literature courses (no matter how methodologically or contextually inclined) are about teaching people to read. In other words — I’m trying to answer your question — reviewing (reading) skills might be best passed on as professional tips in a kind of sub-rosa way rather than being formalised into a course of instruction. On the other hand it would be nice to see the skill dignified by professional recognition! Q: In a 2004 essay you wrote about Andrew Taylor’s work, you ventured to say that “absence, emptiness and silence” might be regarded as the preconditions for writing poetry in Australia. Arguably, these might also be the preconditions for reading it. Yet, if one takes a dystopian view of things, this might be changing. I’m not sure about absence, maybe that’s always with us. Obviously, it’s possible to feel lonely in our crowded cities, but that’s not the same as emptiness. And silence might be going out the window as well — modern culture has become noisier, some might say, thanks to the mass media and so on. Do you worry about the prospects for the writing and, more particularly, the reading of poetry in Australia? Though you obviously don’t have any crystal ball to gaze into what John Forbes once called “the empty future”, how do you imagine Australian poetry in, say, ten or twenty years’ time? A: You speak about the noisiness of contemporary culture. I don’t really have any problems with that (having watched my share of ordinary television shows over the years!). The difficulty is a high culture/ low culture one, I think. People drenched in cultural productions which are tailored to their expectations (producing, if everything goes well, just enough surprises to make you think you are actually meeting something new) react very badly to the idea that there exist art-forms which may give you far profounder experiences but which, unfortunately, demand a lot of work on your part. It may be meeting an entirely new genre (like the Icelandic family sagas, for example, or the Homeric or Sanskrit epics), it might mean coming to grips with an entirely alien culture (those three examples I’ve just given will serve there too) it might even mean learning, or feeling that you are being driven to learn a new language even — and that’s a lifetime commitment! When I was at school (the beginning of many sixty-year-olds’ laments!) we had to read one Shakespeare play a year through high school. I began with Henry V and I can remember that essentially I approached it as an exercise in translation. It was just a ghastly job you had to do — like learning German vocabulary or coming to grips with algebra — nobody sold it to us on the promise that the rewards would eventually make it all seem worth it. But at least it taught those of us who, after four years or so, found the corpus of the Shakespeare plays not only reasonably approachable but immensely engaging, that there exists a category of cultural productions which require initially a lot of work from the reader, who also gives up his or her right as a consumer expecting recompense if the experience doesn’t work (“I’ve bought the collected work of Henry James, read it through and it makes absolutely no sense to me — can I have my money back?”). Alan Wearne put it very well recently when he spoke of poetry being an elitist art open to anybody. It’s bad for poetry when people are encouraged to think that their own immediate interests and responses are the parameters within which quality is determined. I’ve always rather distrusted poetry that I liked immediately — fearing that it might, like popular culture, just be meshing with my existing expectations and prejudices. Basically I’m always optimistic about the future of poetry. It is the oldest of the arts, found in all cultures at all times. It goes hand in hand with language itself. It requires almost nothing to produce though, obviously, it’s healthiest when a culture has publishing and other grants to support it — there is nothing necessary or even beneficial about starving your poets. But what it also needs is respect from a wider audience, the belief that though we don’t understand — or want to have much to do with — this stuff, it’s to be admired. Healthy cultures, as I’ve said in other places, respect their poets and I’ve often wondered about why this isn’t so in Australia. It is a complex question and the answer is not that we are a beer-swilling, football-watching, mob (beautifully described in a comic piece I read somewhere as “descended from the dregs of the Anglophone imperium, from the far end of the Caucasian bell-curve”!). I think one of our problems is that our language, one of the great imperial languages which has eaten up dozens of others and is spoken in so many countries, is not nation-specific. When you have a country like Iceland or Russia, where the borders of the nation are the borders of the language, you are able to see in your poets preservers of that language and expressers of modes of feeling and thinking that are unique to that language.